Maya Songbird: TheREVOLUTION of Every Day Life. TheREVOLUTION of Every Day Life. While in production of my own Revolution "Castro Kid", I got a chance to participate in an Amazing photo Series "theRevolution of everyday life" by my good friend, Photographer Guru, Jeff Straker. Jeff is documenting behind the scenes photos and video as I Revolt against the norm and break all the rules with my "Castro Kid" Debut. Those behind the scenes moments are a special segment of the photo Series and I am so honored to be apart of it. We have had a lot of fun in creating together. Thanks Jeff!
. . . the countervailing impulses of creativity spontaneity and poetry"
theRevolution of everyday life was started in 2008, after Jeff was inspired by reading the actual book titled "The Revolution Of Everyday Life" on a road trip. The book was written in France during the 60s and inspired the uprising in France. In this life right now we are all evolving and revolting against what we have been taught and what we perceive to be our reality. With people taking a stand world wide to change their direction, leadership, way of life. Jeff has captured the art, The revolution of everyday life here in Oakland, particularly West Oakland (The Bottoms). Collaborations with local artist and Revolutionaries makes this photo series refreshing and exuberant. Each photo is your guide, your ticket to freedom. Here is a sneak peak of some of the photos I have shot with Jeff for theRevolution of Everyday Life photo series. I also got a chance to interview Jeff Straker about this project. He talks about what inspired him to push this photo series out, about who he is, and what impact he would like for this project to have on the world. 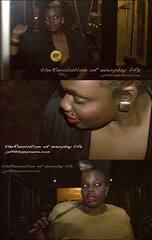 Also Check out the Promo Video for theRevolution of Everyday Life. Are you preparing for your own revolution and want to document? You can also check out more of theRevolution of everyday life Photo series at www.hippysauce.com.